Port Blair the largest town and a municipal council in Andaman district in the Andaman Islands and the capital of the Andaman and Nicobar Islands, a union territory of India. It lies on the east coast of South Andaman Island and is the main entry point to the islands. In 1789 the government of Bengal established a penal colony on Chatham Island in the southeast bay of Great Andaman, named Port Blair to honor Lieutenant Archibald Blair of the British East India Company. After two years, the colony moved to the northeast part of Great Andaman and was named Port Cornwallis after Admiral William Cornwallis. However, there was much disease and death in the penal colony, and the government ceased operating it in May 1796. In 1824 Port Cornwallis was the rendezvous of the fleet carrying the army to the First Anglo-Burmese War. In the 1830s and 1840s, shipwrecked crews who landed on the Andamans were often attacked and killed by the natives, alarming the British government. In 1855, the government proposed another settlement on the islands, including a convict establishment, but the Indian Rebellion of 1857 forced a delay in its construction. However, since the rebellion provided the British with a lot of new prisoners, it made the new Andaman settlement and prison an urgent necessity. 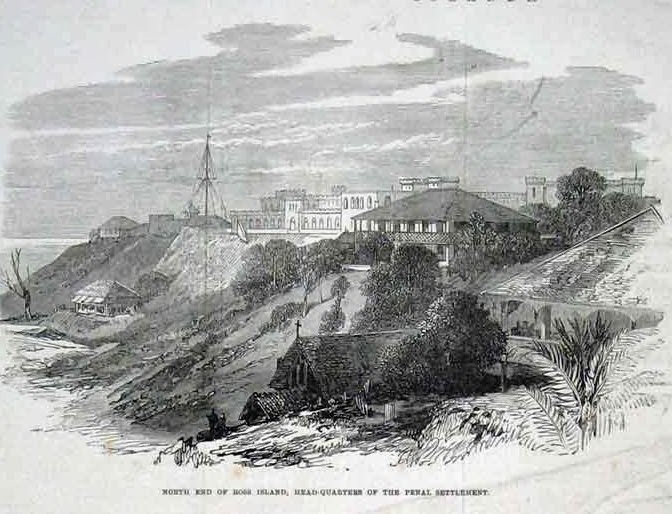 Construction began in November 1857 at the renovated Port Blair, avoiding the vicinity of a salt swamp which seemed to have been the source of many of the old colony's problems. The penal colony was originally on Viper Island, named after Lieutenant Blair's vessel, The Viper. The convicts, mostly political prisoners, suffered life imprisonment at hard labor under cruel and degrading conditions. Many were hanged, while others died of disease and starvation. Between 1864 and 1867 a penal establishment was also built with convict labor on the northern side of Ross Island. These structures are now in ruins. • Cellular Jail :- Built by the British to house political prisoners far away from the mainland. All prisoners were kept in isolation cells and subjected to a brutal work regime, with regular whippings and executions. Briefly taken over by the Japanese during WW2, who added outright torture to the palette. Today, however, the jail has been transformed into an immaculately kept national monument complete with a garden that seems very much at odds with the horror of the place.You can watch it from morning 9:30 a.m to 4 p.m. A light-and-sound show in Hindi (6 pm) and English (7 pm) available in the evenings. Some days the timings are alternated. Jail is closed on Mondays although the light and sounds is still on in the evenings. • Andaman in Rs 20 Currency Note A picture is taken from the veranda of GB Pant Hospital Port Blair, Which features on Rs.20/- note of Indian currency. • Corbyn's Cove (beach) :- Only beach of Port Blair city. Popular with locals for swimming and watching the sunset. However, part of the beach was washed away by the 2004 tsunami. • Mini Zoo :- A medium size zoo containing some species only found on the islands. which is now shifted to its new place at Chidiya Tapu. • Japanese Bunkers :- near Corbyn's Cove. Bunkers built by the Japanese army during World War II. There's one more right down the hill from Cellular Jail. • Chatam Saw Mill :- Chatam A saw mill, oldest in Asia. Also the Chatam jetty is where ships from Calcutta/Chennai loaded with goods enter Port Blair. From the jetty passenger jetty is available for Bamboo flat and Dundus Point. 10 Rs/person inclusive of camera. • Samudrika Naval Museum :- This museum has nice display of corals and live fishes. Also has a shop where you can buy local items. 20 Rs/person. Still camera - Rs 20.